Today I had a plan. A plan that would be decisive and benefit many. Much thought and research went into this plan. And what was this about? Eating naturally! So many a time we would stand around after softball, looking dumbfounded trying to decided where to eat. Often, people look to me for guidance. However, I'm never one to make long lists of restaurants we should eat at... until now. I took the time and did the legwork and made 4 pages of potential eats ranging from the exotic to the regular. You see, with so many different tastes, a variety is necessary. After all, Silent Bob's aversion to exotic Asian cuisine is quite app arent when he needs a lesson every time we suggest something in Richmond. Who knows, he probably thinks Dim Sum is a mathematically-challenged individual. Another part of my plan was to finally take advantage of our willingness to dine out on a Monday night. Surely there must be a deal to be had somewhere. 2 places that immediately came to mind were Q4 (formerly Quattro) and Pinky's. Yah I know, if you are familiar with both establishments, it really shouldn't be any contest. 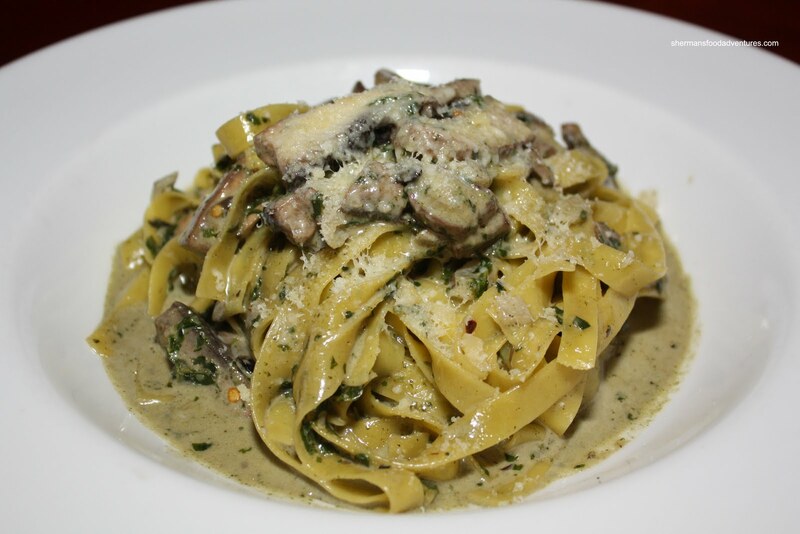 On Monday nights, Q4 has their $10.00 pasta (it has gone up to $12.00) special while Pinky's (now since closed) entire menu is 50% off (or so we t hought). Apparently, after deciding to give Pinky's a try (despite better judgement), we found out upon arrival that the 50% special no longer exists. Fine, it probably was an omen anyways. We headed a bit further down the street to Q4. There was one little problem though... We were not really appropriately dressed nor smelling the best after softball. Miss Y proclaimed that one could dine anywhere in Vancouver in sweats. Well, she maybe more comfortable with our attire than I was. Call me self-conscious; but my track pants and Nikes were really out of place here. Maybe if I did the whole track suit thing and had an Italian accent, I could've gotten away with the being a Soprano. Anyways, I have to credit the staff. Generally, they didn't even care how we were dressed and it was friendly throughout the night. Other than myself, everyone else had water since they were quite thirsty after softball. 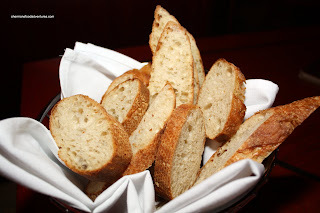 With the excellent complimentary bread with balsamic vinegar and olive oil, it very much resembled the Friend's episode where they were so shocked at the prices, they only had water and bread... Yah, poorly dressed, reeking of sweat, eating complimentary bread and drinking water. You'd think they'd kick us out. Nope, they were good, they get props for that! So when we got down to ordering, Boss Woman and I got greedy and picked out 2 pastas each. That's right, we got 2. 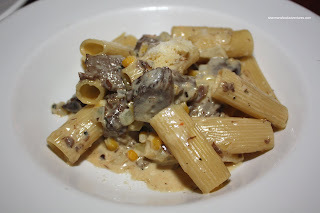 For my first pasta, I went for the Pasta di Nonno (housemade pasta of the day) which was rigatoni with short rib, corn, parmigiano reggiano and cream. 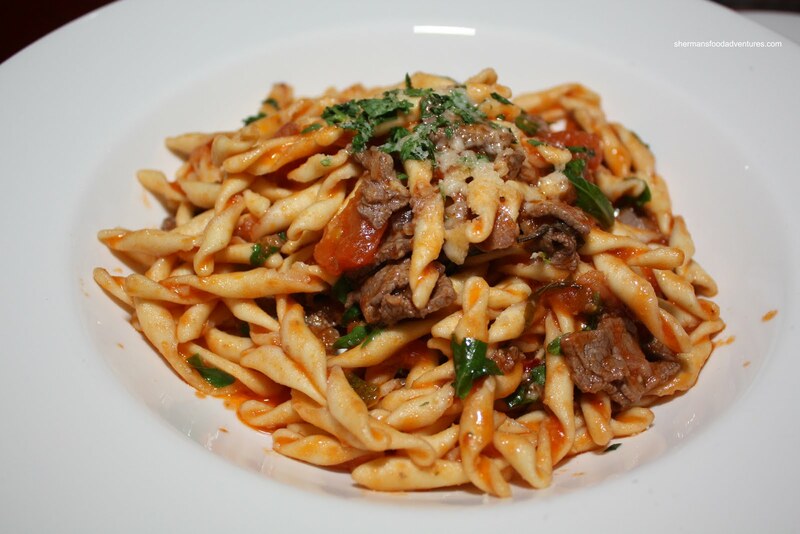 With extremely al dente rigatoni and loads of big, tender nuggets of short rib, this pasta plain rocked. There was just enough cream to basically coat the items on the plate with sweetness provided by the corn. My second pasta was the Fusilli Con Rucola which consisted of handmade fusilli with shaved beef tenderloin, arugula, fresh tomato and parmigiano reggiano. Not as al dente as the rigatoni (was expected since it's smaller), there was a nice lightness to this pasta as opposed to the cream of the rigatoni. The fresh tomato provided tartness, with some good bitterness from the arugula. Both Judes and Boss Woman had the Linguine Frutti di Mare which consists of fresh tomatoes, white wine, peperoncino and seafood. Also with al dente pasta, the flavours were clean. 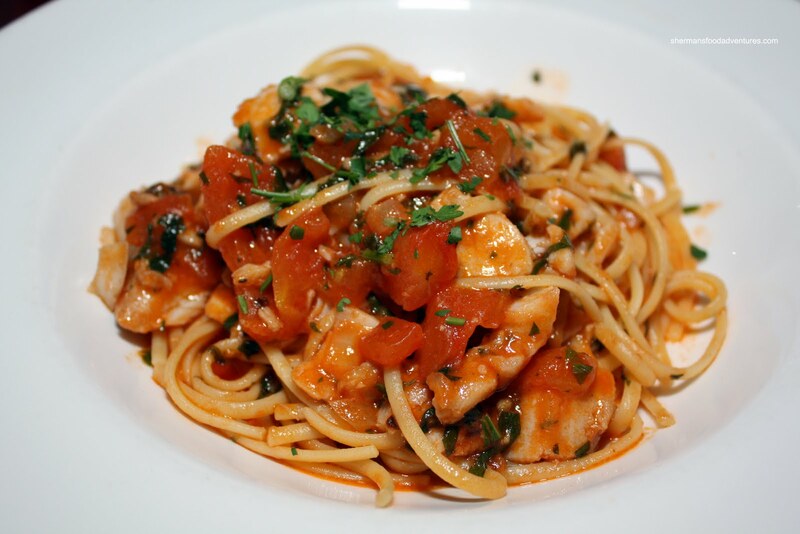 The fresh tomatoes and herbs combined with the perfectly prepared seafood made for an enjoyable eat. The peperoncino helped add a slight kick; but not so much to actually classify it as spicy. 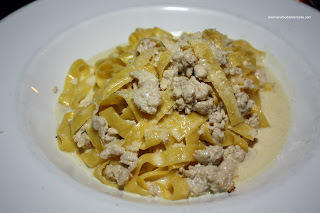 Boss Woman's second pasta was the Fettucine Ghiotone which consists of minced chicken, cream and brandy. As you can see in the picture, there is nearly as much chicken as pasta. This, along with the brandy cream, made for a rich and hearty pasta (even thought it was chicken). Once again, the fettucine was al dente. Milhouse had only one pasta and he regretted that decision. Not that one wasn't enough, it's just that he can always eat more. He looked longingly at our second pastas... His only pasta was the Penne Salsicce with chorizo and portobello in a tomato ragout. His pasta was al dente and very flavourful with a nice tangy bite. Ingredients were fresh and there was an underlying spiciness from the sausage. 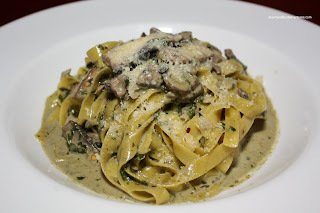 Bear had a slight problem ordering since he has a few food allergies and settled on the Fettuccine Tartufate which consisted of wild mushrooms, pesto cream and parmigiano reggiano. However, he isn't a big fan of funghi, so he ended up picking it out. I'm not sure what type of bear he is since some bears eat mushrooms and some do not. Anyways, he asked for his pasta to be prepared extra al dente and it came out so in a creamy pesto which was actually quite light tasting. Bear was very happy with the amount of sauce since the pasta was not drowning in it. Miss Y went for the Penne Arrabiatta. It is a spicy mixture of pancetta, mushrooms, fresh tomatoes and peperconico. Unlike the rest of us, her penne was a bit past al dente and a tad salty (probably due to the pancetta). She really enjoyed the fresh crushed tomatoes; but thought that the pasta could've been spicier. She was generally happy with the value since it was only $10.00 and in a very nice restaurant to boot. Being that I was pretty stuffed from my 2 pastas, I decided to share a dessert with Miss Y. We decided on the Ciliege Filate or sour cherries and marscapone cream sandwiched between layers of crunchy, sweet phyllo. 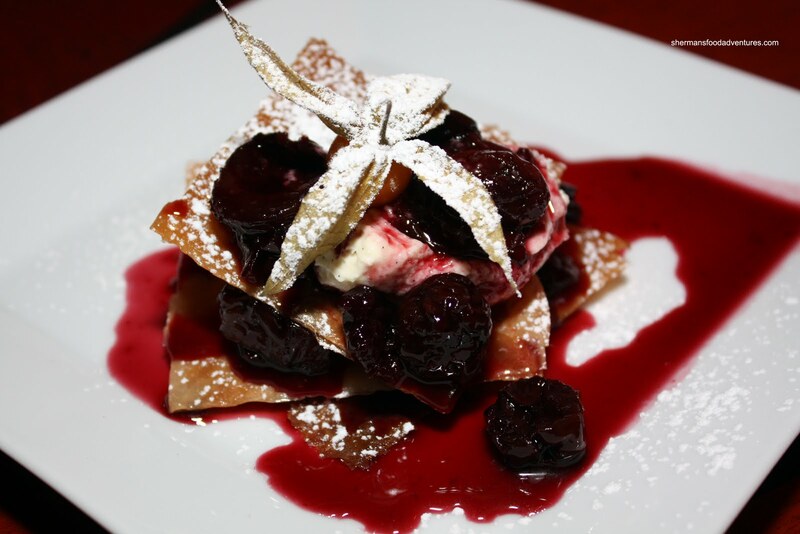 We were both impressed with the balance and contrast of flavours - sourness of the cherries with the sweet crunch of the phyllo and smoothness of the marscapone. Milhouse went for the Chocolate Brownie. It was quite sweet, rich and chocolaty. He liked it; however, it was nothing that floored him. Judes ended up with probably the best dessert of the night with the Tiramisu. Before she even took a bite, we were all staring at it longingly. Not your run-of-the-mill tiramisu found at most places, this was a flavour explosion. With a decadent creaminess, there was strong rum and coffee hits. 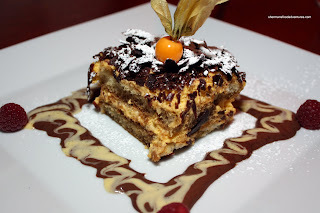 There was no denying that this was an actual tiramisu. Bear was debating on the which dessert to choose and I was quite happy he decided on the Creme Brulee. Why? Because with that decision, we covered all of the desserts for the night! Yah, I have a one-track mind... A nice hard sugar topping revealed a semi-sweet, velvetly custard. One spoonful and it was enough to exude a vanilla essence which smelled and tasted very good. Bear, being the dessert fiend that he is, thought this was done very well. 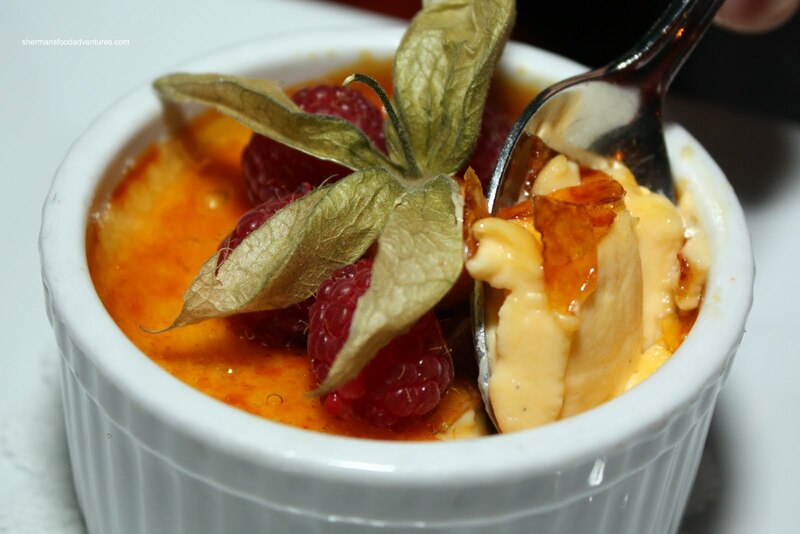 We also felt that at roughly $8.00 each, the desserts were reasonably-priced for the level of refinement and execution. As a group, we were very pleased with the pastas and desserts at Q4. Personally, this is the type of pasta that I absolutely love. Pefectly al dente pasta with just enough sophisticatedly prepared sauces in the proper portion size. It is practically the antithesis of the pastas offered at places such as Anton's and Amorosa. No offense to those places since they have their fans, I'm just not into the big plates of soft pasta covered with enough sauce to drink. 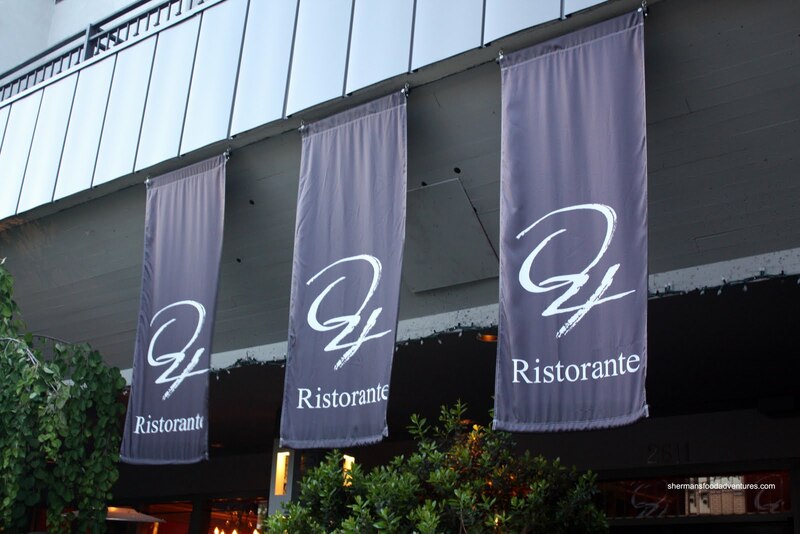 Considering that the ambiance and service at Q4 emanates class and refinement, $12.00 for any of their pastas on Monday and Tuesday nights is an absolute steal. 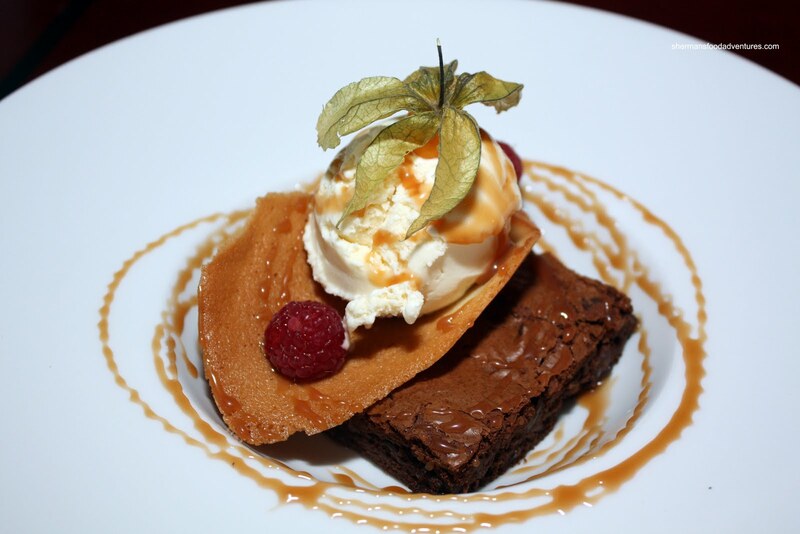 We were further impressed with the expertly crafted desserts. 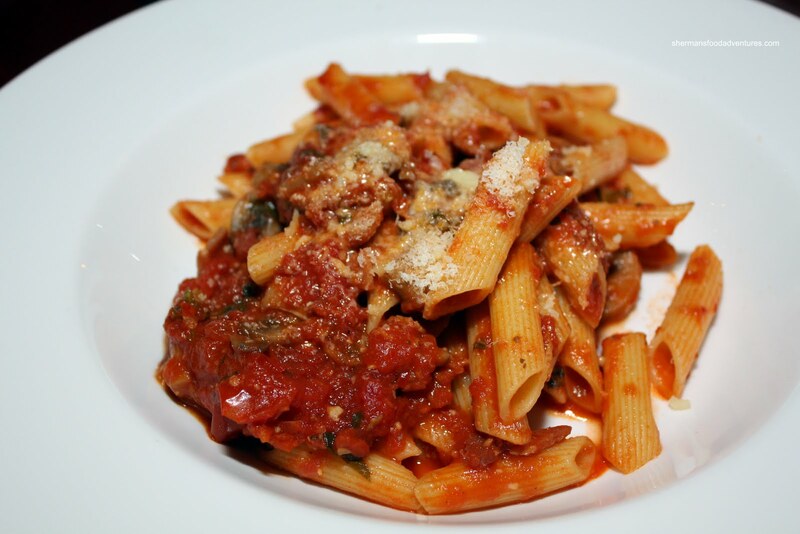 - $12.00 for all pastas on Monday and Tuesday! Will have to admit the food does look good and having discounted prices make it more enticing. However, here is sort of loaded question (to the restaurant, not you): Is that the regular size dish or it is smaller? I mean, if you were able to finish two plates! To the best of my knowledge, the pastas are the regular size. I know they had a prix fixe menu that had smaller portions; but the pastas haven't shrunk. 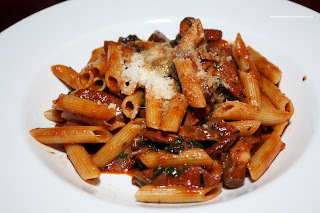 In terms of the 2 pastas I ate, one was actually enough since there was plenty of shortrib in the rigatoni. I only finished 2 because I'm a glutton. Boss Woman ended up finishing half and half, thus only one pasta. 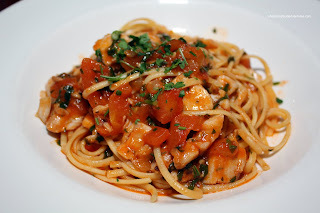 In terms of quality of pasta, I'll admit that the ones I had at Q4 were pretty darn close, if not as good as Cioppino's. So yes, it is a fabulous deal that I feel people should try out. $10 is not a lot of money for this type of quality.